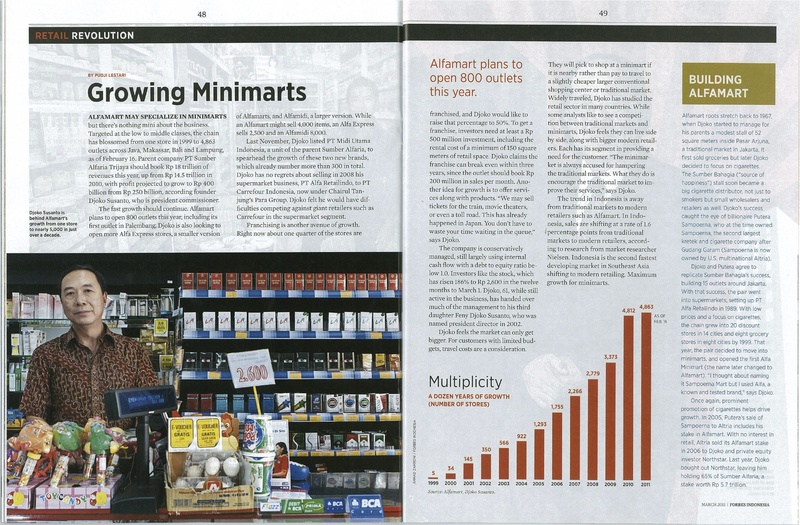 Alfamart may specialize in minimarts but there’s nothing mini about the business. Targeted at the low to middle classes, the chain has blossomed from one store in 1999 to 4,863 outlets across the islands of Java, Makassar, Bali and Lampung, as of February 16. Parent company PT Sumber Alfaria Trijaya should book Rp 18 trillion of revenues this year, up from Rp 14.5 trillion in 2010, with profit projected to grow to Rp 400 billion from Rp 250 billion, according founder Djoko Susanto, who is president commissioner. The fast growth should continue. Alfamart plans to open 800 outlets this year, including its first outlet in Palembang. Djoko is also looking to open more Alfa Express stores, a smaller version of Alfamarts, and Alfamidi, a larger version. While an Alfamart might sell 4,000 items, an Alfa Express sells 2,500 and an Alfamidi 8,000. Last November, Djoko listed PT Midi Utama Indonesia, a unit of the parent Sumber Alfaria, to spearhead the growth of these two new brands, which already number more than 300 in total. Djoko has no regrets about selling in 2008 his supermarket business, PT Alfa Retailindo, to PT Carrefour Indonesia, now under Chairul Tanjung’s Para Group. Djoko felt he would have difficulties competing against giant retailers such as Carrefour in the supermarket segment. Franchising is another avenue of growth. Right now about one quarter of the stores are franchised, and Djoko would like to raise that percentage to 50%. To get a franchise, investors need at least a Rp 500 million investment, including the rental cost of a minimum of 150 square meters of retail space. Djoko claims the franchise can break even within three years, since the outlet should book Rp 200 million in sales per month. Another idea for growth is to offer services along with products. “We may sell tickets for the train, movie theaters, or even a toll road. This has already happened in Japan. You don’t have to waste your time waiting in the queue,” says Djoko. The company is conservatively managed, still largely using internal cash flow with a debt to equity ratio below 1.0. Investors like the stock, which has risen 186% to Rp 2,600 in the twelve months to March 1. Djoko, 61, while still active in the business, has handed over much of the management to his third daughter Feny Djoko Susanto, who was named president director in 2002. Djoko feels the market can only get bigger. For customers with limited budgets, travel costs are a consideration. They will pick to shop at a minimart if it is nearby rather than pay to travel to a slightly cheaper larger conventional shopping center or traditional market. Widely traveled, Djoko has studied the retail sector in many countries. While some analysts like to see a competition between traditional markets and minimarts, Djoko feels they can live side by side, along with bigger modern retailers. Each has its segment in providing a need for the customer. “The minimarket is always accused for hampering the traditional markets. What they do is encourage the traditional market to improve their services,” says Djoko. The trend in Indonesia is away from traditional markets to modern retailers such as Alfamart. In Indonesia, sales are shifting at a rate of 1.6 percentage points from traditional markets to modern retailers, according to research from market researcher Nielsen. Indonesia is the second fastest developing market in Southeast Asia shifting to modern retailing. Maximum growth for minimarts. Alfamart roots stretch back to 1967, when Djoko started to manage for his parents a modest stall of 52 square meters inside Pasar Arjuna, a traditional market in Jakarta. It first sold groceries but later Djoko decided to focus on cigarettes. 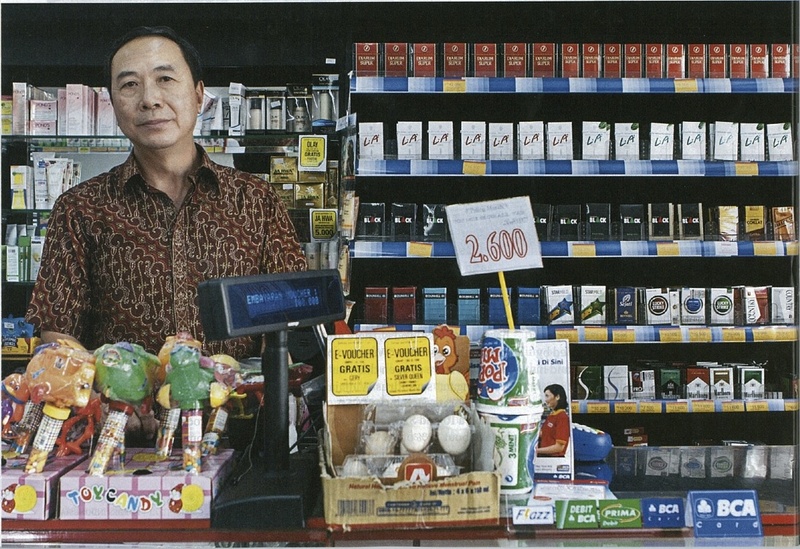 The Sumber Bahagia (“source of happiness”) stall soon became a big cigarette distributor, not just to smokers but small wholesalers and retailers as well. Djoko’s success caught the eye of billionaire Putera Sampoerna, who at the time owned the Sampoerna, the second largest kretek and cigarette company after Gudang Garam (Sampoerna is now owned by U.S. multinational Altria). Djoko and Putera agree to replicate Sumber Bahagia’s success, building 15 outlets around Jakarta. With that success, the pair went into supermarkets, setting up PT Alfa Retailindo in 1989. With low prices and a focus on cigarettes, the chain grew into 20 discount stores in 14 cities and eight grocery stores in eight cities by 1999. That year, the pair decided to move into minimarts, and open the first Alfa Minimart (the name later changed to Alfamart). “I thought about naming it Sampoerna Mart but I used Alfa, a known and tested brand, created by Putera,” says Djoko. Once again, prominent promotion of cigarettes helps drive growth. In 2005, Putera’s sale of Sampoerna to Altria includes his stake in Alfamart. With no interest in retail, Altria sold its Alfamart stake in 2006 to Djoko and private equity investor Northstar. Last year, Djoko bought out Northstar, leaving him holding 65% of Sumber Alfaria, a stake worth Rp 5.7 trillion. * This story appears in March 2011 issue of Forbes Indonesia magazine. It is part of retail revolution report, the magazine theme for March edition. This entry was posted in Companies, People, Publications and tagged Alfa Express, Alfa Minimart, Alfa Retailindo, Alfamart, Alfamidi, Carrefour Indonesia, Djoko Susanto, Midi Utama Indonesia, Para Group, Putera Sampoerna, Sumber Alfaria Trijaya, Toko Sumber Bahagia by Pudji Lestari. Bookmark the permalink.